Weighing almost a TON, Simuwu Tetrapod (or Simuwu Rectangle Ding) is the largest & heaviest bronze ware in the world. It was named after three characters engraved on it: 司母戊. It means “to commemorate my mother Wu”. 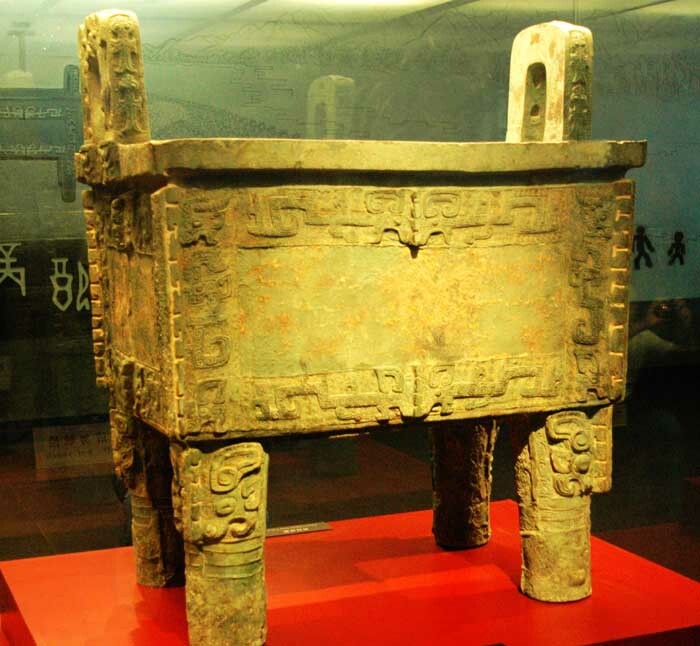 King Wending of the Shang dynasty created this huge vessel to commemorate his mother (whose name is Wu 戊). This ding is a representative of advanced casting technology and rich bronze ware culture of Shang dynasty. To cast such a huge bronze ware, more than 1000 kg of raw metal material as well as large furnaces was needed. And it needed around 70-80 skilled craftsmen to cooperate and fulfill the work. Though this ding is big and heavy, its workmanship is exquisite. The relief of Kui (a one-legged mythical animal) was carved on four sides of the ding. The animal figures are portrayed with artistic exaggeration and create a ferocious, mysterious and dignified mood. Dings were used in the Chinese primitive society as cooking utensils. 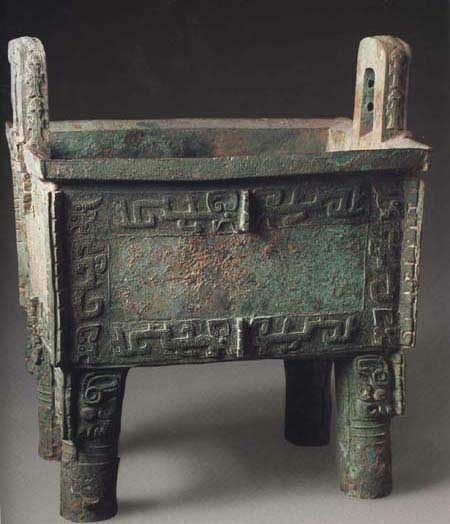 Initially they were made of clay, but as metallurgy emerged and developed, bronze was used instead at the end of the Shang Dynasty some 3,000 years ago. By that time, dings had become sacrificial vessels symbolizing the owners’ power and wealth and then the symbol of the nation. There are lots of Chinese idiom in which ding is used to represent the regime of nation, such as “问鼎中原” “三足鼎立”. It was World War II time. In 1939, this ding was unearthed by local farmers in Anyang, Henan Province. It was so big and heavy that it could not be moved after being unearthed. The Japanese invaders tried on several occasions to rob it from those farmers. Fortunately people made a mock and successfully prevented it from being robbed by Japanese invaders. To protect the rare cultural relic, local people reburied it and then unearthed it again after the war in 1946. That October, it was transferred to Nanking as a gift from local governor to then President of China – Chiang Kai-shek for his 60th birthday. He was very happy about it and took a picture with it. In 1949, when he failed in the civil war, he tried to transfer it to Taiwan together with other culture relics. But people gave up on this ding because it’s too heavy to handle. So this precious bronze ware was left in mainland China. Simuwu Tetrapod is now at the National Museum of China. This is the 4th of 64 culture heritages that the government of China forbids to exhibit abroad. The complete list is here. In Chinese. 文言 is hard. It is made because recording material was so rare and inconvenient that you have to be precise and save words when you write. However, it still expresses very well. It’s amazing! Some people say modern Chinese is full of unnecessary words, although it still saves more space than other languages.